The Thinklogical FiberPASS is a signal conditioner, which essentially converts one type of optical signal into another type of signal. This media converter is used to convert/repeat different fiber signals, multi-mode, single mode, or CWDM. This makes it an ideal solution for fiber conversion and extension between facilities and/or different router networks. 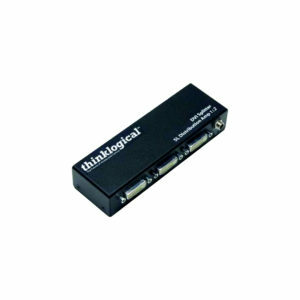 The FiberPASS can be deployed in conjunction with Thinklogical’s Velocity line of extenders. It allows for a Velocity (KVM or video) transmitter to connect with a receiver regardless of the fiber type. The FiberPASS is designed to accept a fiber input/output from the transmitter unit (L1/L2) on one SFP+ module and repeat it on another SFP+ module, which is then ready for interfacing and connection to a receiver unit (L1/L2). The signal data is regenerated and re-clocked in both directions for optimal performance. The FiberPASS is easy to install and configure.